Normally it’s a silly thing to buy pre-popped popcorn from the store. It’s overpriced, and in the end, it turns out to be just popcorn. Nothing really that special emerges from the container. (Unless of course we’re talking about a giant, oversized tin of holiday popcorn that comes in a three flavors. This of course, does not count in my evaluation.) However, I must say that in a sudden moment of munchy-fueled “must have snack now” impulse buying, I discovered a popcorn that might warrant an exception. 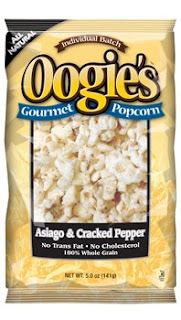 Oogie’s Gourmet Popcorn is $3.99 a bag. And despite its deliciousness, let’s not forget that the main ingredient here is popcorn. It’s still a bit pricey, considering. But I’m willing to splurge every now and again. Also, I’m totally addicted to it. Here are the three flavors we’ve tried so far. This was my favorite, though Beta Wife chose the Asiago as her number one. The most complex of the three we sampled, I had expected it to be my least favorite. Pesto flavored foods have the capacity to turn out so very wrong. But this is so, so right. Cheesy, salty, tangy, and not too bad with a martini. My least favorite, just because in comparison it lacked excitement. Still really quite tasty. Leave the bag within reach for too long and there’ll soon be no more popcorn. I expected this to taste like another generic cheese popcorn. After all, most cheese popcorns all really taste the same, don’t they? But this one had a nice light flavor with a subtle smokiness that hits you after the salty taste. Much more complex in flavor than you’d expect. Find them locally at Andronico's markets. Here at Oogie's, we couldn't agree with your assessments more! The Romano & Pesto really is the most complex flavor we make, the Smoked Gouda definitely has the right amount of smokiness (and actual gouda cheese, btw), and the Asiago always simply disappears.